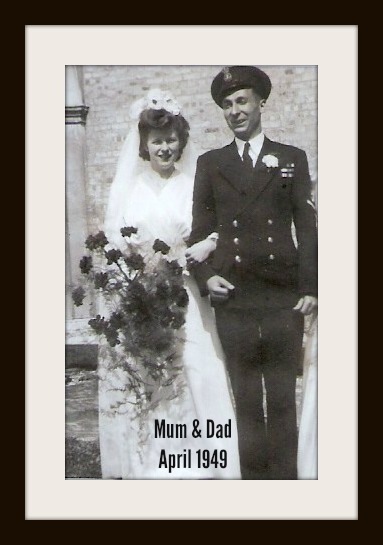 I was back in England last month, to be with my parents as they celebrated their 65th Wedding Anniversary. A 65th (Sapphire) Anniversary is quite a rare achievement – only 1% of couples stay married and alive that long – and Mum and Dad received a card from the Queen to mark the occasion (the Queen and Prince Philip celebrated their own 65th a couple of years ago). Congratulations to my parents and we look forward to their 70th anniversary. We were staying near the ancient town of Northampton, centrally located in the heart of England. The town is best known for its shoe industry. In the 1830’s around a third of the male population were engaged in shoe making (hence the nickname of the town’s football team, Cobblers). That industry is virtually all gone now – one or two up-market brands survive such as Church’s, but the old factories are nearly all demolished or converted into flats or offices. The town has successfully reinvented itself as a services and distribution hub and the southern half of the county currently enjoys the second lowest unemployment rate in Britain. 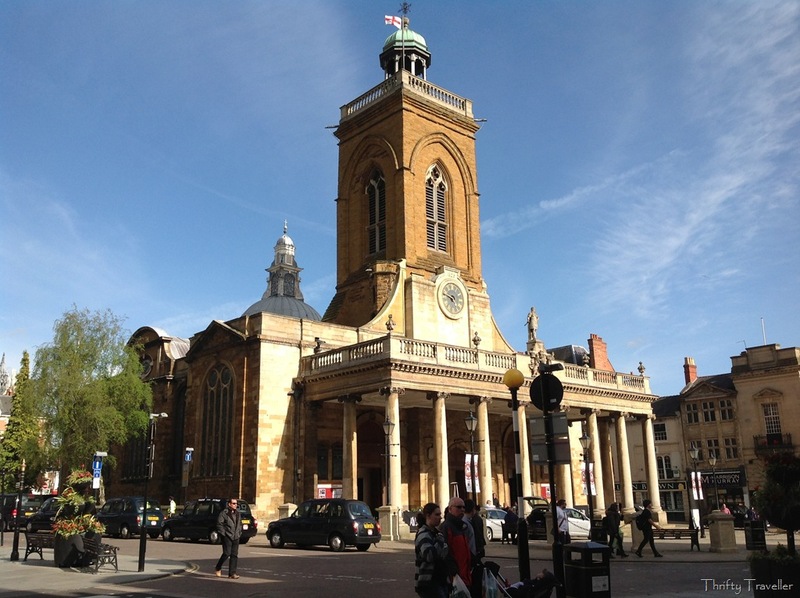 The town of Northampton is not especially renowned for its historic sites (thought the county of Northamptonshire has many) but a few gems exist and are worth a visit. 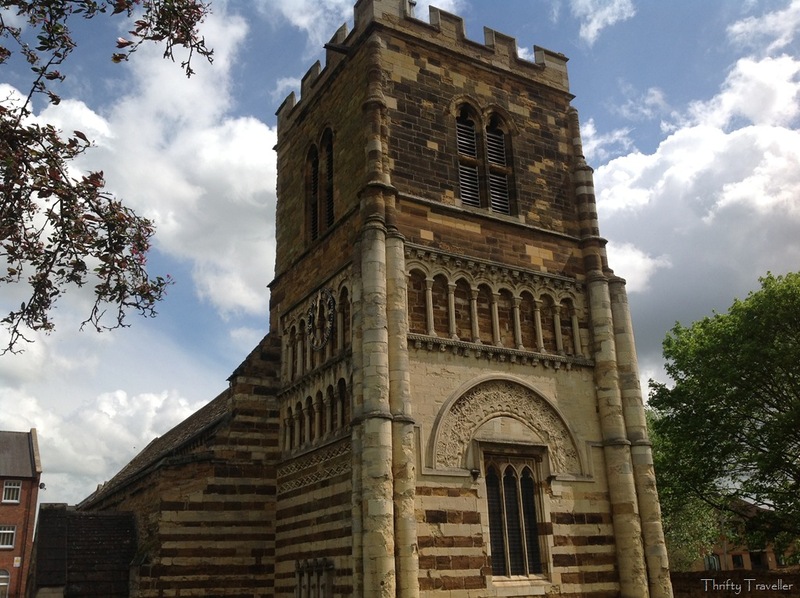 St. Peter’s is reckoned to be the finest Norman church in the county and erected around 1170 by Simon de St.Liz (Senlis), first Norman Earl of Northampton, on the site of an earlier Saxon church. The fine two-tone banded stonework on the exterior and on the interior arches is a particular feature and reminiscent of Moorish architecture (perhaps an early Crusader brought back the idea from the Middle East). The church marks the location of the original Saxon settlement of Hamtun from which the town developed. Displayed inside the church is this fine Anglo-Saxon grave slab, which was possibly the tomb lid of St. Ragener, a soldier who died in 870 fighting the pagan Vikings, for which he was awarded sainthood. Yes, Northampton even has its own saint! 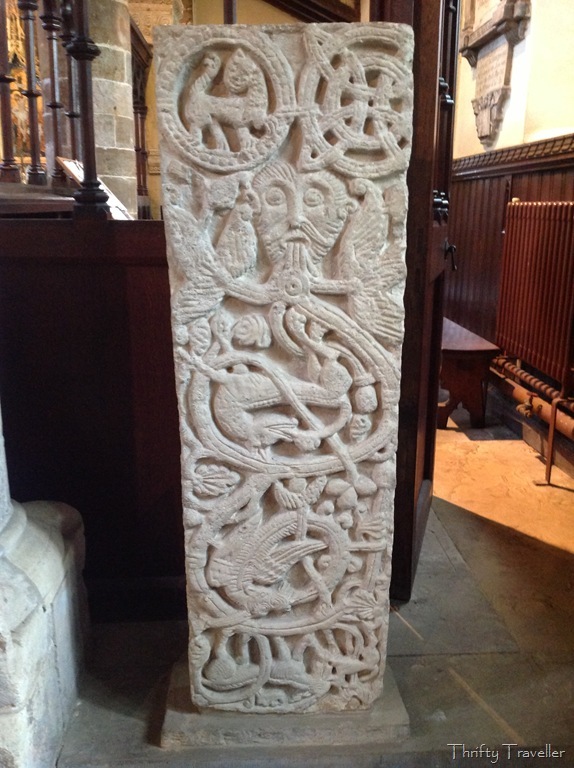 The slab depicts the face of the Green Man entwined in foliage and various animals and birds. When this grave was discovered beneath the floor of the old Saxon church it was said to have helped a crippled woman to walk and performed other miracles. Impressed by this, King Edward the Confessor had a gold and jewel encrusted shrine erected here for the Saint. Sadly no trace of the precious shrine remains. This well preserved example of Elizabethan architecture is located close to St. Peter’s on Marefair. The building is thought to date from around 1570, with later additions. It is one of the few houses to have survived the Great Fire of Northampton in 1675. 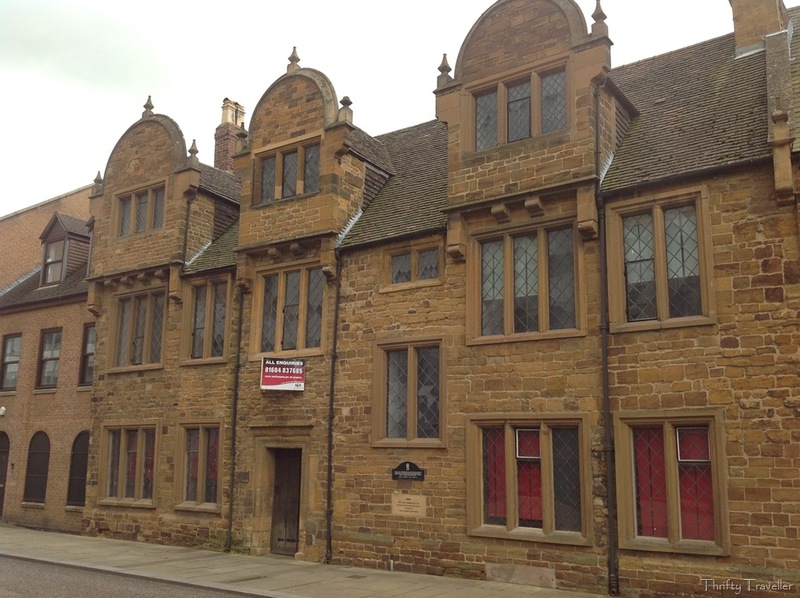 Folklore has it that Oliver Cromwell stayed here on the eve of the Battle of Naseby in June 1645. The town was known to have sympathies with the Parliamentarian side in the English Civil War and provided several thousand pairs of boots to Oliver Cromwell’s roundhead army, for which the makers never received payment. After restoration of the monarchy King Charles II punished the town by pulling down its castle and walls. 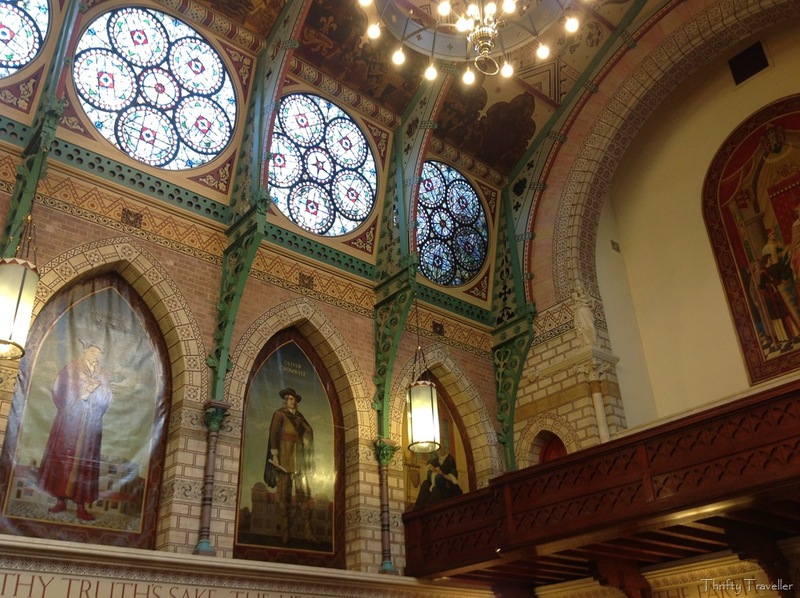 A much newer landmark is the Guildhall built in 1864 in imposing Victorian Gothic architectural style. They were holding a vintage fair during our visit so we were able to get a peek inside. The main hall is decorated with stain glass windows and portraits of British Kings and Queens (and that man Cromwell again!). In the centre of town is All Saints which was built in 1680 following the Great Fire. Charles II supplied the timber and stone for its construction (perhaps feeling guilty about demolishing the castle?). In gratitude the townsfolk erected a statue of the king above the portico from where he has a good view of McDonalds but, as a snub, he is depicted wearing a Roman skirt tunic, which, together with his long hair, makes him look rather effeminate. Obviously the locals were still smarting over supporting the losing side in the Civil War. Talking of Romans, it was they who are said to have laid out the town’s market square and used it a marshalling point for distributing supplies to their forces around the region. Even those days the town’s strategic location was recognised as a logistics hub. 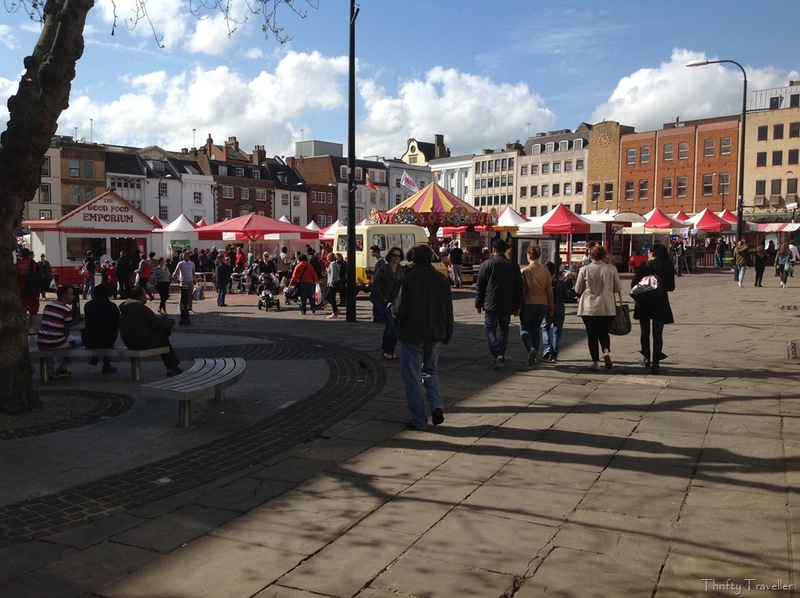 Today the Market Square is reputed to be the largest fully enclosed market square in England and many of its surrounding buildings have retained their historic old world charm. There are said to be secret tunnels running underneath the square.